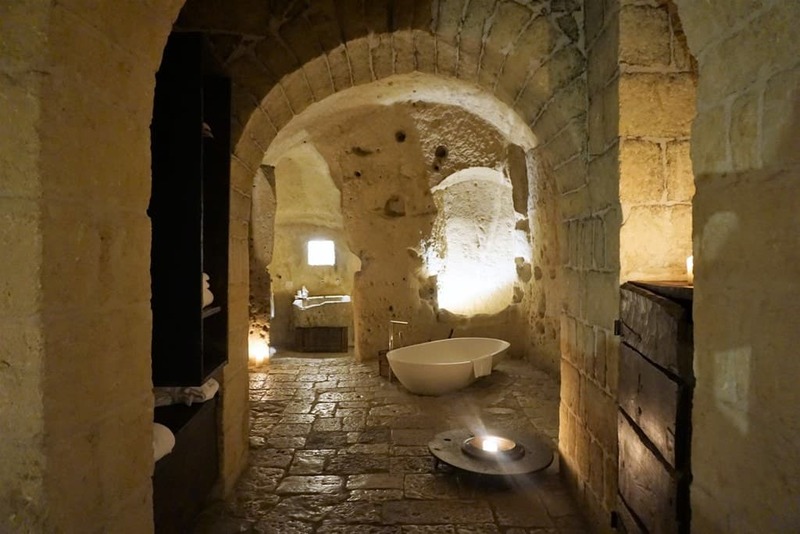 A while ago, my husband and I were looking for unique accommodation on Glamping Hub, when we came across Le Grotte della Civita, a Sextantio hotel. 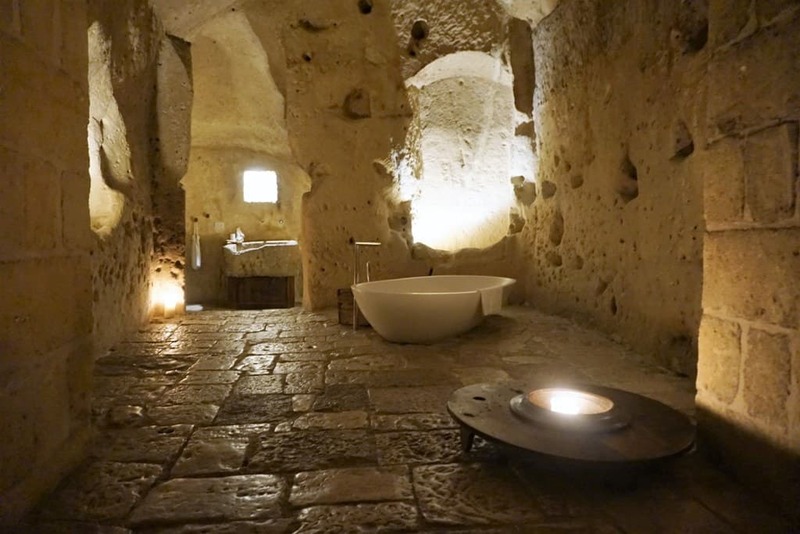 The Sextantio le Grotte della Civita is a beautiful hotel set in the historic Sassi caves at Matera, Italy. 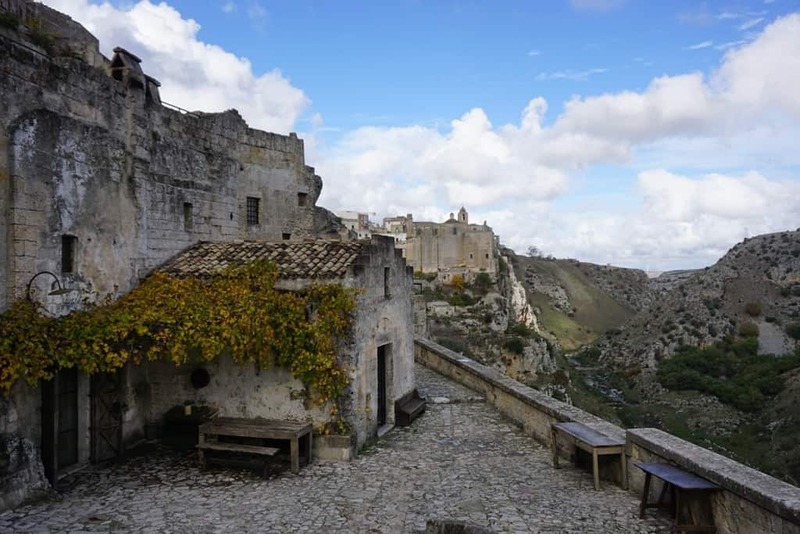 Matera lies in the southern Italy’s historic Apennine mountains and is world-famous for its Sassi quarters. 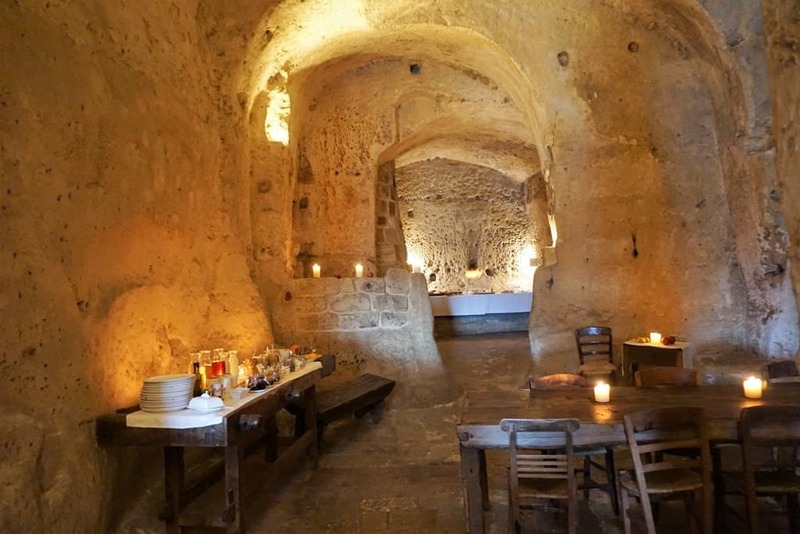 The Sassi are caves which were used as dwellings in the Stone and Bronze Ages. 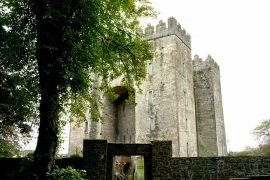 In the Middle Ages, they housed monasteries. Later, the inhabitants filled the caves with their farm animals. It wasn’t until recently that they realised the importance of the caves and began preserving them. 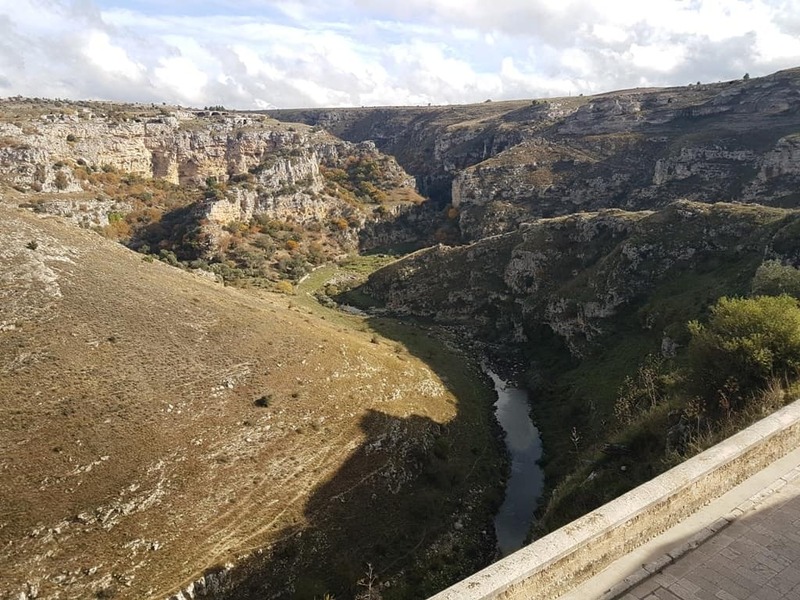 Sextantio Le Grotte della Civita is located in the oldest part of the Sassi quarters, known as the Civita, which faces the Murgia Park and its spectacular rock-hewn churches. There are 18 rooms and one large former church, now a relaxing common space, at the hotel. All are quite large and were renovated into sumptuous luxury quarters while still retaining their original features. The project, which took place in the early 2000s, preserved both the existing architecture and local heritage while incorporating modern, luxury amenities. Italian-Swiss architect Daniele Kihlgren integrated traditional design made from local materials with modern comforts. 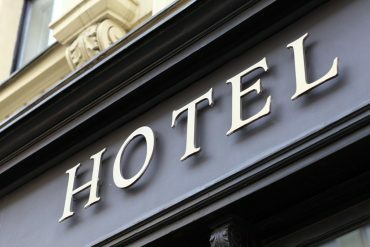 The 18 guestrooms are slightly different, but there are four categories – Classic Room, Superior Room, Suite, and Executive Suite. Classic rooms are 30-35 square meters, with a queen- or king-size bed, while superior rooms (45-70 square meters) feature a king-size bed. Suites have king-size beds as well as one or two twin-size beds. 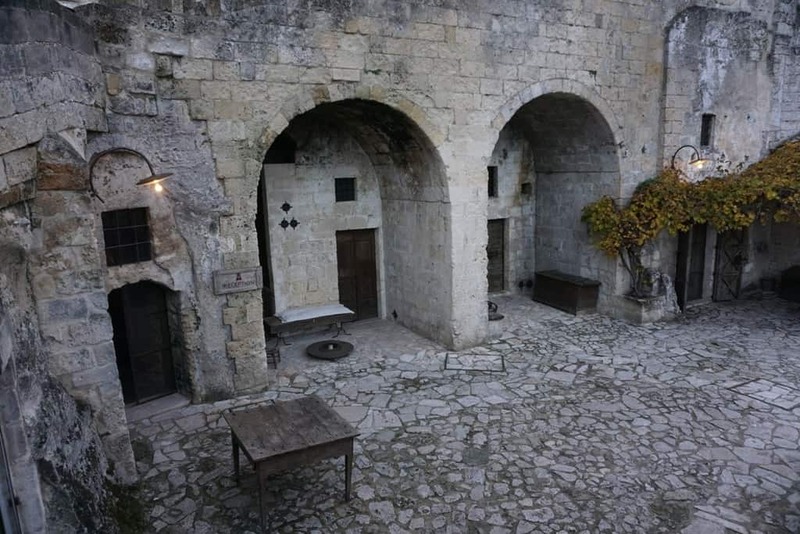 As it is a traditional hotel, the floors and walls are natural stone. 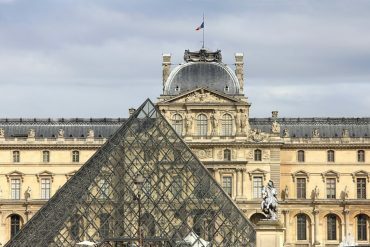 There is a floor heating and cooling system, although stone naturally retains both. 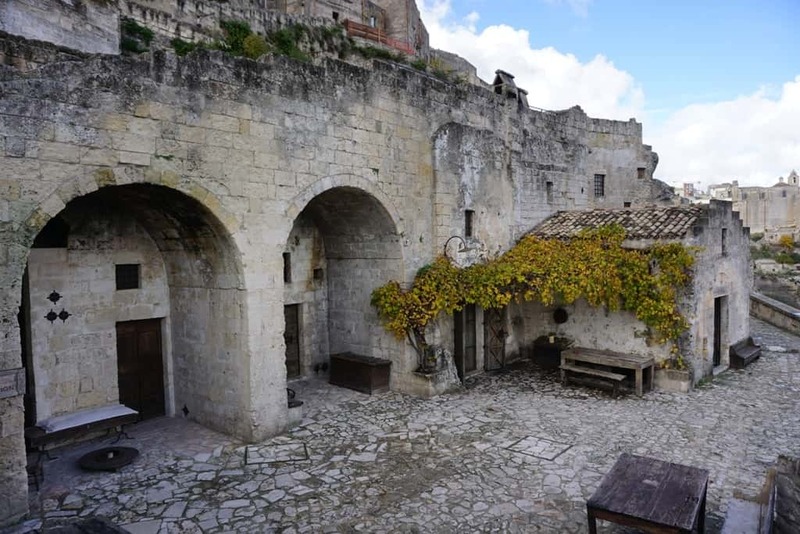 Upon our arrival at Sextantio le Grotte della Civita, we were shown into reception. We did not have a car during our stay, but there is both car parking and valet service available if you do. 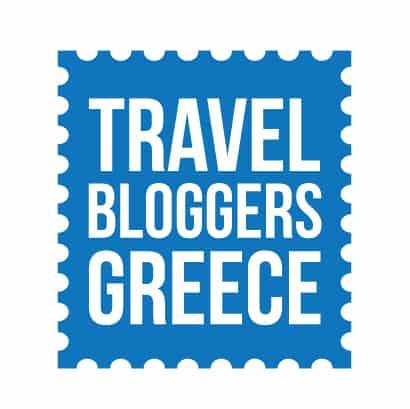 The check-in process was simple and quick, and then we were shown to our room. We stayed in cave number three, a Superior Room, for both nights. 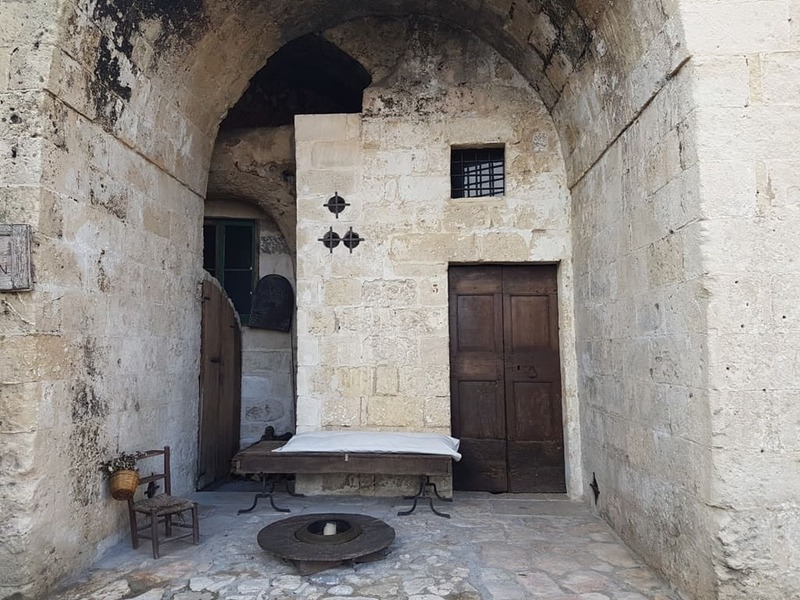 It is quite long; the entrance opens into a small room with a wooden table. The bedroom is beyond that, with a large bed adorned with plush pillows and a soft ergonomic mattress that are complemented with handcrafted rough linen. The next room has a large deep soaking bathtub in it – a relaxation room – while the toilet and bidet are in a small room at the back. 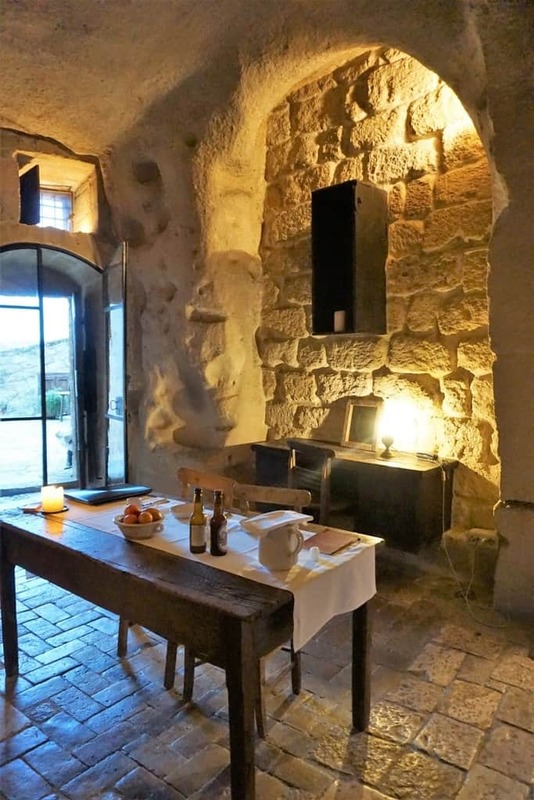 The cave rooms have all the comforts of home, including free wifi – but no television. They are lit with natural candles as well as some lamps. Our room had a mini bar along with a basket of fruit and jug of water. All of the bowls and jugs in the room are made from traditional handcrafted earthenware pottery. The bathroom came equipped with natural shampoos, shower gels, toothpaste, and soap. There were also bamboo toothbrushes, bathrobes, slippers, and a hairdryer. 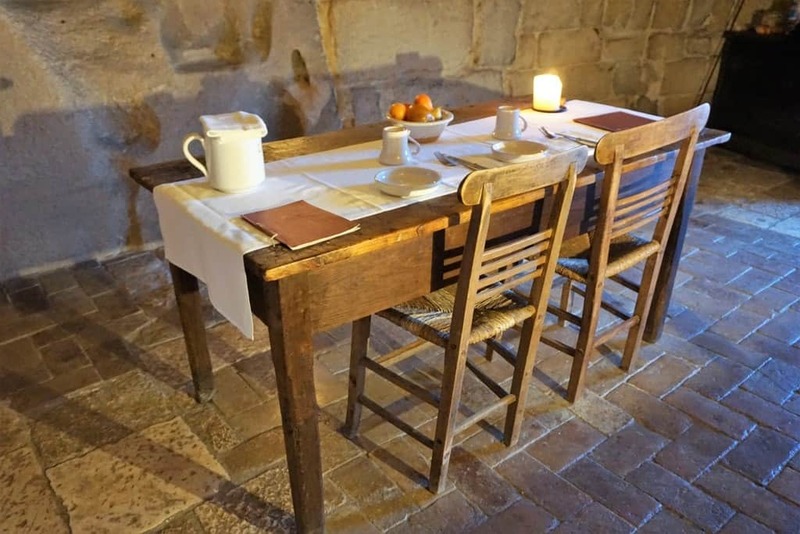 Breakfast, which is included in the room rate, was served in the former chapel. 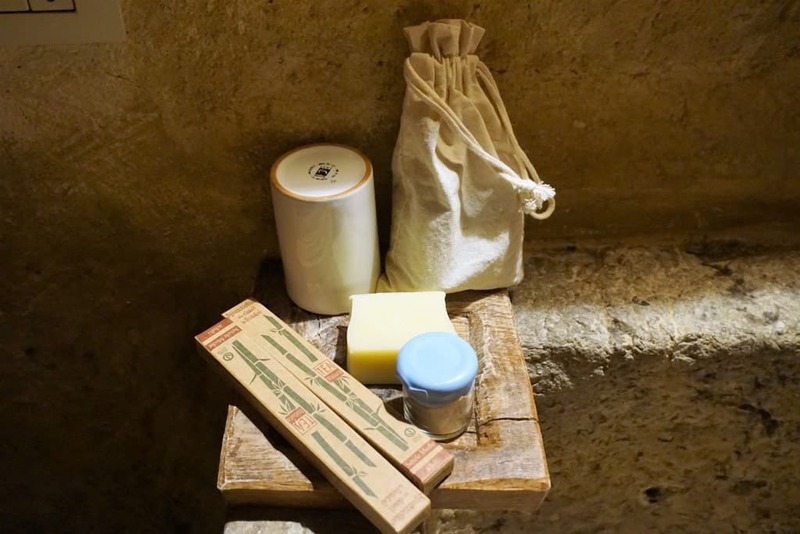 This 13th-century church is a beautiful, vaulted space lit with natural beeswax candles. They source the majority of their bread, produce, meats, and cheeses from local organic farms or other trusted artisan producers in the area. 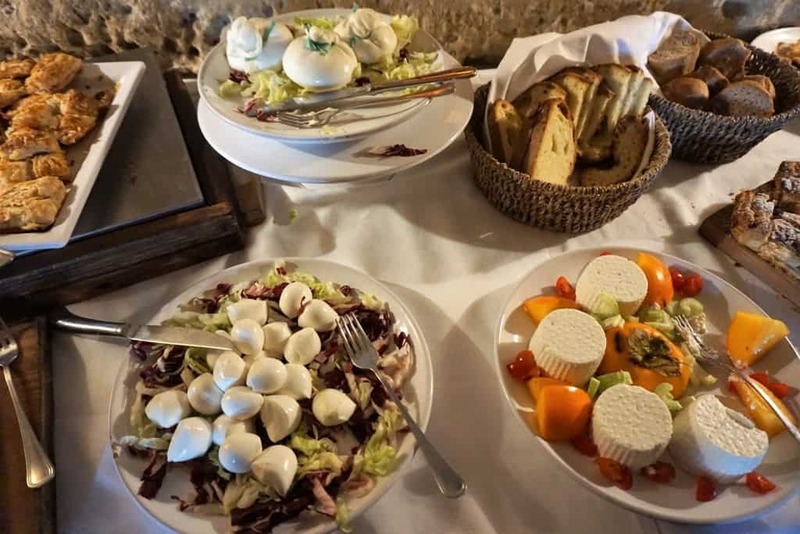 The breakfast served is a traditional southern Italian breakfast, which includes cakes, pastries, freshly baked bread and focaccia, seasonal fruits, marmalades, fresh yogurts, cheeses, salami, and more. In the afternoon, the hotel offers aperitifs in the church. These are typically local wines and tisanes as well as a selection of snacks. 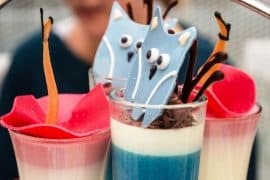 These can be enjoyed in the dimly lit church or out on the terrace, which has a panoramic view of the historic region. 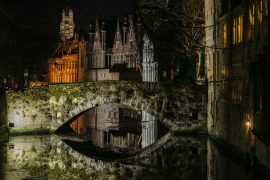 Dinner is not available at the hotel, although it is possible to book the entire church in advance for a private dinner. The hotel offers private cooking classes as well. You’ll have the chance to meet with a local “cuoca” (female chef) and learn the ancient art of handmade pasta making. Once you’ve crafted the cavatelli, orecchiette, and calzoni to perfection, you’ll get the chance to eat your creations. 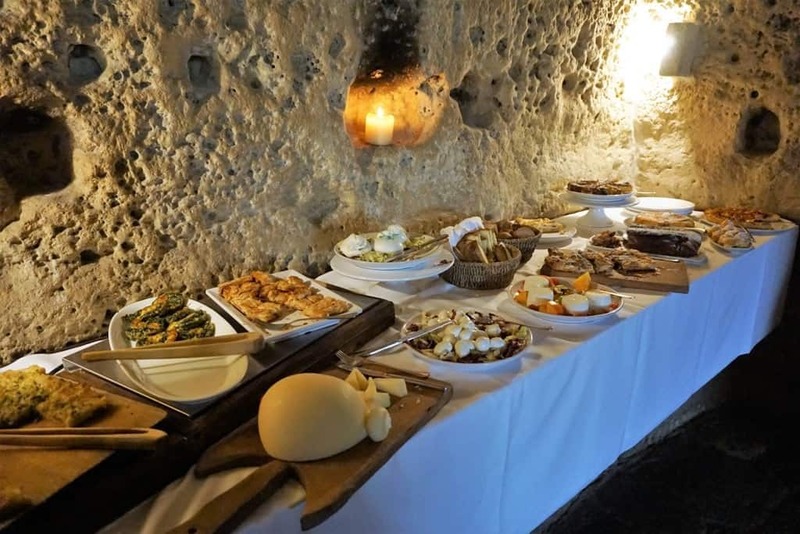 Sextantio Le Grotte della Civita can also arrange bread and cheese making lessons as well as local wine tastings. 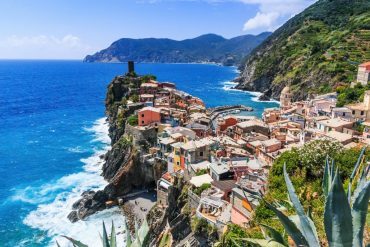 While the hotel is located in the hills of southern Italy, there are chances to visit the nearby seaside for a day. 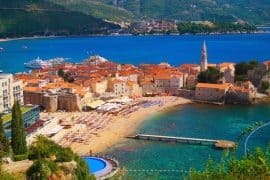 The hotel can arrange excursions and send you off with a fully-equipped picnic basket to savor by the sea. Guests can also hire bicycles from the hotel for an additional charge. 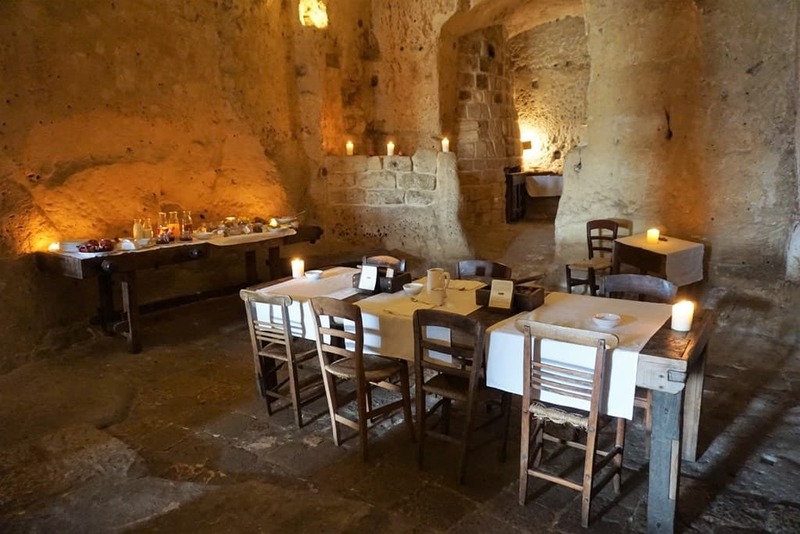 Sextantio Le Grotte della Civita has a variety of itineraries listed on their website for exciting full-day outings, from archaeological tours of Magna Grecia to medieval castle ruins and night guided tours of the Sassi. 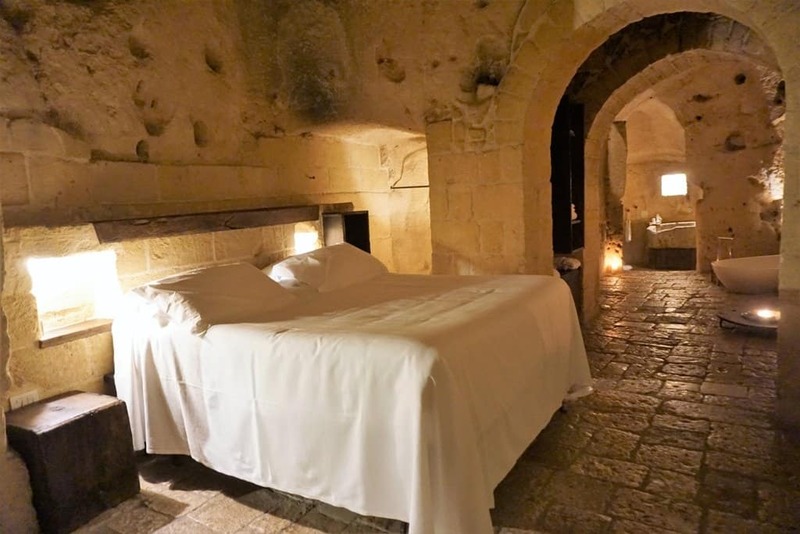 And, of course, after a full day of exploring the unique lunar landscapes of Matera, you may wish to have a massage! 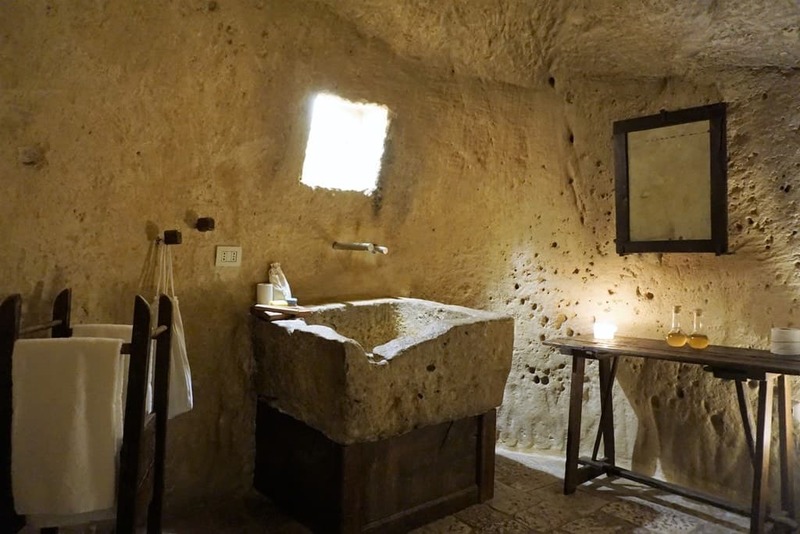 Sextantio Le Grotte della Civita offers a variety of massages in the privacy of your own cave. 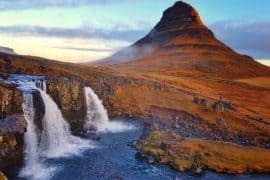 An expert therapist will discuss your needs and then suggest the best form of treatment, from reiki to deep tissue, all with herbal teas and essential oils. 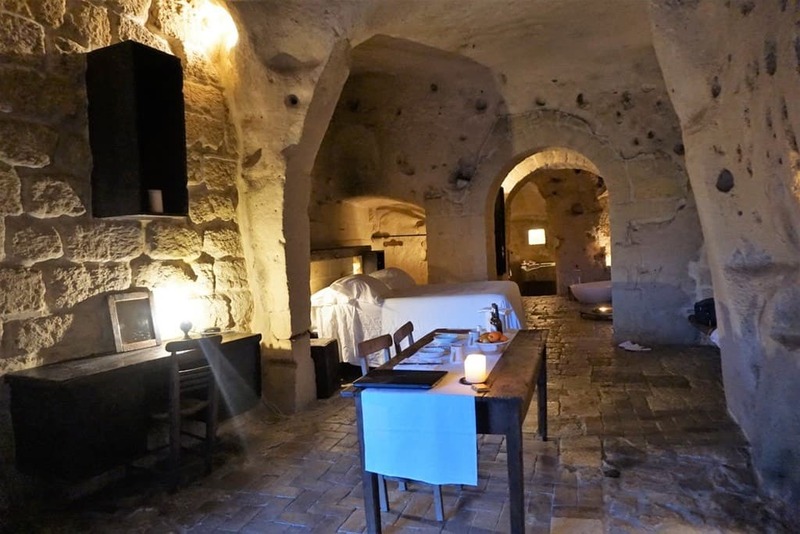 My husband and I very much enjoyed our entire stay at the Sextantio Le Grotte della Civita and I highly recommend it! 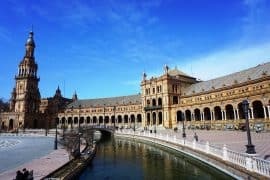 It is the perfect destination for a weekend getaway, perhaps as an addition to a week in Rome or Naples. Personally, it might just be the best hotel I have ever stayed at! 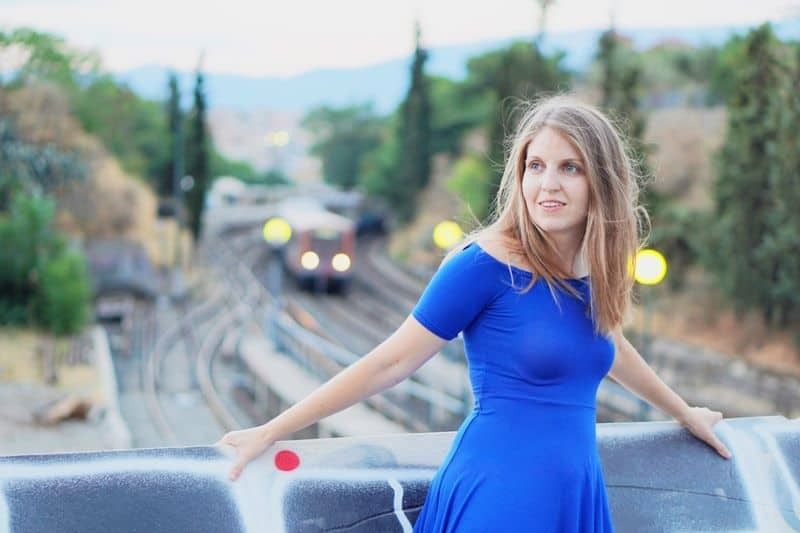 I was a guest of the Sextantio Le Grotte della Civita, but as always opinions are my own.